A resource for Inter-Christian, Intercultural Couples, Parents and Families. 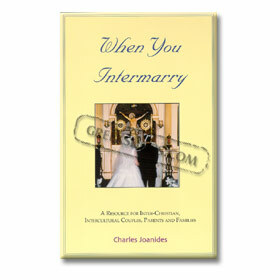 - Premarital preparation materials written for couples intending to intermarry. "In this book, Father Charles Joanides uses his gifts of love, spirituality and the ability to listen to describe honestly the lives of interfaith couples in all stages. As a Lutheran who married a Greek Orthodox, I appreciate his sensitivity to all viewpoints and his approach as a family and its spiritual journey. Thank you, Father, for helping us understand our lives with such compassion." Mary Rouvelas, Author, "A Guide to Greek Traditions and Customs in America"